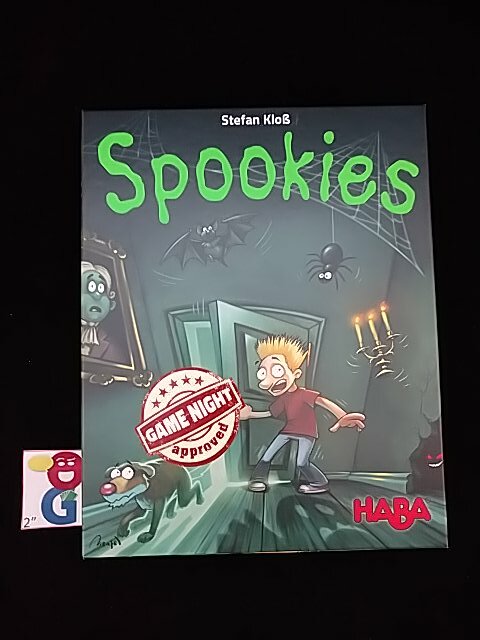 Spookies is the second game that I have played from the new HABA line for families – as the box proudly proclaims, Spookies is “Game Night Approved”. The first game in this series for me was Karuba – you can see my review for it here. In Spookies, there are 5 brave adventurers (4 teens and a dog) that are exploring a haunted house. As they explore the house and move upwards to the attic, they will score points for the player who controls them. 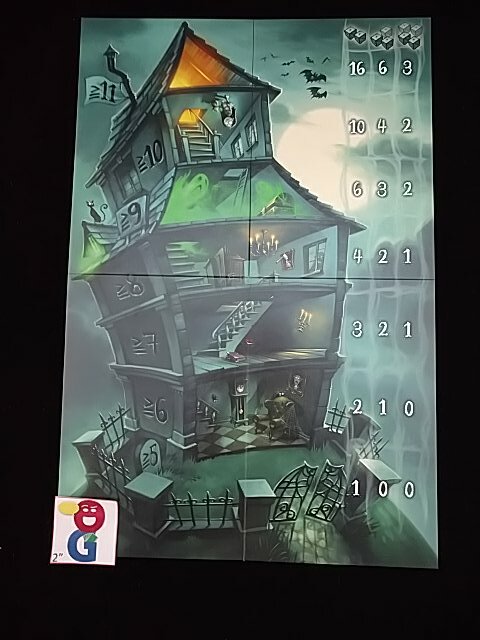 The haunted house is shown on the board with 7 levels on it – stretching from the front yard all the way up to the attic. The lowest level of the house, the front yard, has a value of 5 listed next to it. As you go up the floors of the house, the number needed increases by one until you reach the attic which has 11 next to it. There is a scoring chart to the right of the house for everyone to consult during the game. There are five wooden movers that represent the explorers. A friend die has one side for each of the explorers and one wild side. There are also four regular d6 that are used for movement. Finally, there is a supply of 75 scoring chips valued from 1-5. 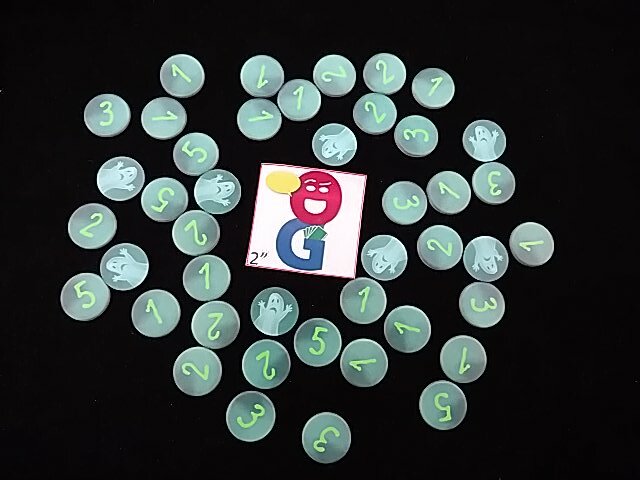 To start the game, you turn all the scoring chips face down, shuffle them and select the designated number of them based on the number of players – the excess chips are returned to the box unseen. As long as you meet or exceed the number on the floor above your chosen character, you move the character to the next floor. You then collect the appropriate number of scoring chips based on the level attained and the number of dice rolled. Note that these always stay facedown, so you won’t know how many points they are worth. If you were successful, you can decide to stop and keep all the chips that you have collected, or you can continue to try to move that same character further up the haunted house. If you roll the number of the floor you are currently on – nothing happens. You score no points, and your turn ends. If you roll less than the floor you’re currently on – you character has to move downstairs, down to the level of the number that you have rolled. But, you must also pay a penalty of one scoring chip per level you had to move downwards. (Again remember that you don’t know what value is on the chip as they remain facedown). These penalty chips are placed on the level of the house where you started the turn. 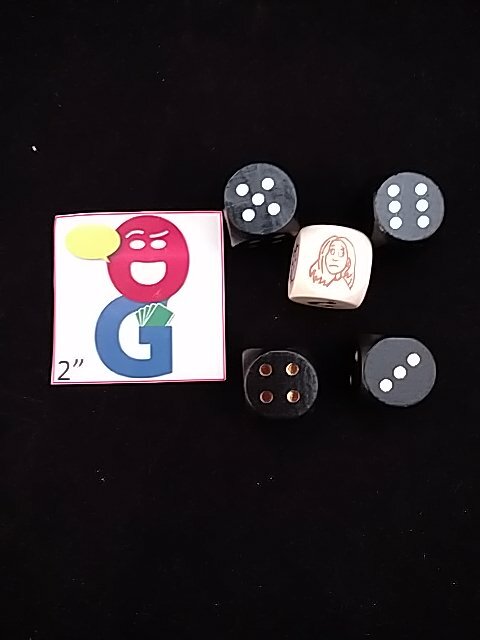 They remain on that space and are collected by the first player who moves any character onto that particular floor when using only two dice to achieve the needed number. That lucky player collects ALL of the penalty chips found on that level. The game continues until the entire supply of scoring chips has been picked up. Whenever that happens, the game immediately ends. Any chips left in the haunted house (which had been paid as penalties) are simply not counted. Players then flip over all collected chips they have at that time, sum up the total, and the player with the most points wins the game. Spookies is a nice twist on the press-your-luck dice game genre. The rules are very simple to pick up and explain, and the game moves along very quickly. Each turn, you usually get an interesting choice – usually trying to figure out the risk/reward of rolling different number of dice at each level. The payoff difference can be huge – at the attic, you can collect 16/6/3 chips for rolling 2/3/4 dice – so the game definitely doesn’t make the decision easy. The first roll of each turn, the friend die, determines your character for the entire turn. If that character starts the turn at the bottom, you might have the chance to see just how far up the house you can go. However, if you get someone who is already in the attic, you best result might just be to not lose too many chips in penalties and live to fight another day. Some of this is balanced out by the higher pay-offs for the higher levels – though I haven’t done the math, it wouldn’t surprise me if your expected value of chips is the same at each level. The other thing that balances out the game is the fact that you have no idea how many points you are scoring per chip. In the end, you just try to get as many of them as you can and hope that they are high valued when it comes time to score. The upside of this is that most players are in the game the entire time because it is actually possible for a player who has only 8 chips to score more than a player who has 30 chips – therefore, until you actually turn them over and count, no one would be considered to be out of the game. If you take the game lightly, you’ll do fine. Because in the end, you don’t have as much control over your results as you want. You will make decisions, roll dice, and collect (or lose) VP chips – but you really won’t know how you’re doing until the final count happens. As this game is short, it doesn’t bother me at all – and it also prevents me from slowing down the game to try to do the math on a particular roll. I just tend to make a play that seems fun and go with it. For families and casual gamers, this should be a great game. I just wouldn’t expect to see a tournament for this at WBC… For my group, it’s a quick casual filler – short, filled with laughs/cheers/groans at good/bad/unbelievable die rolls, and something where the experience is more important than the result. Craig Vollmar: Spookies is the kind of game that comes along and puts a smile on my face. Why? Because it’s easy to learn, easy to teach, plays quickly, and most importantly, is a lot of FUN. Make no mistake, Spookies is a dice-rolling, push-your-luck game that involves A LOT of luck, but that’s okay because it’s meant to be a light-hearted experience and games only last 15-20 minutes. I like the dual nature of the push-your-luck component in that the choice to continue involves both how many dice to use and how high to attempt to climb through the house. There is also the higher risk associated with failing in that the progress gained during the turn can be lost as well as a penalty of leaving behind some scoring chips if the failure is less than the current level. The double push-your-luck and extra risk associated with failing turn this light game into something a bit deeper, but not a game that requires too much thought that it would slow down turns. I also like that everybody has a chance to win due to the hidden score system and range of point values on the chips. Overall, this is an engaging and fun game that’s great for friends and family or as a quick escape between heavier games. Karen Miller: This game is a perfect game for a multi-generational game night. 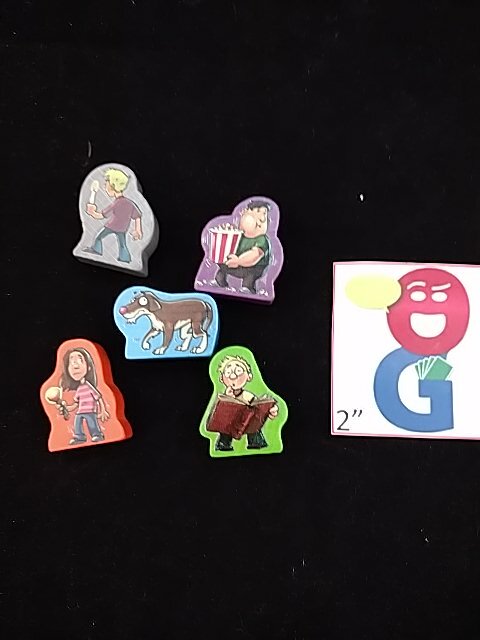 Everyone will have fun trying to collect the point chips and cheering or groaning as they roll dice and try to decide how much to push their luck. This entry was posted in Essen 2015, Reviews. Bookmark the permalink. Has HABA provided any explanation of what “Game Night Approved” means? Is it just branding on their part to signify their new line of heavier games? There has been no official explanation – I think it’s just marketing. Similar to Hasbro’s “Game Night” logo here in the States.